Low prices. OrangeSmile.com offers car hire service in Bolivia on the lowest-rate-guarantee basis, since we work with car suppliers directly. For your search criteria in Bolivia, we always select and show the best rental offers. The car reservation process consists of 3 simple steps: (1) search for available cars for your dates in Bolivia; (2) select your car type; and (3) fill in the booking forms. Once the reservation is completed, you will receive a confirmation voucher to your email address. During the booking process, please check your rental conditions. To pick up your car at the rental point in Bolivia, you need to provide our confirmation voucher, your driving license and a valid credit card. The final payment is normally carried out at the pick-up point. Our car hire points in Bolivia accept VISA, MasterCard, etc - please check your rental conditions. At the pick-up point, please read the handling manual and check the car for present defects. OrangeSmile.com wishes you a pleasant journey to Bolivia! The car hire reservation system OrangeSmile.com allows renting a vehicle in Bolivia within 10 minutes. Our largest database of car suppliers enables us to provide you a rental car in Bolivia at the cheapest rate ever possible. At rental locations in Bolivia we offer the following car sizes: mini, compact, economy, standard, premium and luxury. The following car types are available in Bolivia: Sedan, Hatchback, Jeep, Cabriolet, Coupe, Minivan and Minibus. During its centuries old history, Bolivia has become home to many places of interest and historic landmarks that are known far beyond the borders of the country. The peak of the San Pedro Mountain is one of most popular landmarks that attract both locals and tourists because the largest crucifixion in the world is installed there. The height of the statue of Christ is 33 metres. The statue was installed not long ago, before that the statue of Christ on the Mount Corcovado in Rio de Janeiro was considered the highest one. That statue is 27 metres tall. Colorful markets have become a true landmark of Bolivia. The most famous market is called Mercado de Hechicería that can be literally translated as “Witchcraft market”. This huge market is located in the capital of the country, the city of La Paz. The market got such a name for a reason – the majority of items for sale are various witchcraft artefacts, herbs and talismans. It is possible to buy potions and amulets to cure every kind of disease in Mercado de Hechicería. A statue of an old Indian god is the most popular souvenir that tourists enjoy buying. It is believed that the statue protects its owner from bad luck. The most famous nature sight of Bolivia is, probably, Lake Titicaca that is also the "highest navigable lake" in the world. It addition to magnificent nature and beautiful skyline, the lake has one more secret. In 2000, during one of numerous exploration campaigns, an ancient Indian temple was found on the bottom of the lake. The temple was built approximately 1500 years ago. Therefore, a sight of international level is buried deep under waters of Lake Titicaca. Fans of active rest and sports activities have always been in love with the Ands. Eastern slopes of the mountains are perfect for alpine climbing. There are also several national parks in the piedmont region – Isiboro Secure, Pilon Lajas and Huanchaca. 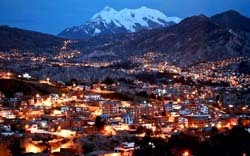 The city of Oruro is a popular tourist spot. The city is famous for its colourful festivals and carnivals. During the festival season, the population of Oruro is several times more than usual. Naturally, that happens because of thousands of tourists who come to see the show. Pagador is a place that will please fans of architectural landmarks. There are many old buildings in the town, the most famous ones are Mint House and Cathedral built in the 16th century. The biggest museum in the country (the National Museum) is located in the capital and exhibits a large collection of artefacts. When traveling in a group, consider a minivan option - it will be cheaper than renting a couple of standard-size cars. Please note that in Bolivia vehicles with more than eight seats require a special type of driving license. If during your vehicle inspection (pick-up time) you identify defects, which are not specified in the rental document, please place a demand to fill in the rental card correctly.